This kid is an artist. For real. Holy cow. On the first page alone you see his talent. There are birds and people and geometric dots and shapes and patterns and an incomplete tic-tac-toe game. Every color of the rainbow, the entire visible spectrum, is present. Backgrounds, foregrounds, topsides, bottomsides, all painted. And, since he’s such a thoughtful young man, he skipped the paper and canvas and painted directly on the walls. Won’t Mom be pleased? Mom declares, “Ya ain’t a-gonna paint no more!” She puts the paints on the top shelf of the closet and plops Jr. and his loyal canine accomplice in the tub. And that’s that. Until, of course, our young Michelangelo climbs to top of the closet to retrieve the tools of his trade and begins to bit by bit, rhyme by rhyme, body part by body part, coloring his colorless world. “So I take some red and I paint my…” Head. “Aw, what the heck! Gonna paint my…” Neck. “But I’m such a nut, gonna paint my –” WHAT? I know what you were thinking. Rhymes with nut, it hasn’t been painted yet, it’s underneath his tighty-whiteys which have just been removed revealing a very white full moon in a universe of color. Yeah, I know what you’re thinking. Regardless of the tune (and I’ll let you know as soon as someone recognizes my dum dums), any book that makes kids laugh out loud and call out words is a winner in my world. I Ain’t Gonna Paint No More! 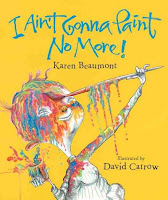 will have them giggling, Karen Beaumont’s rhymes will have them singing, and David Catrow’s illustrations will have them begging for more. UPDATE: So the word on the street says the tune is "It Ain't Gonna Rain No More," which is apparently a campfire song. Funny thing is, after three summers as a camp counselor, I'd never heard of it. And then – as I am writing this, no less – in the background I hear the “There Ain’t No Bugs on Me” commercial as my kids watched some cartoons. Now it’ll probably be everywhere. Ten bucks says someone is humming the tune in line ahead of me this afternoon in the grocery store. The reason you do not know that song is that Luther songs are by far superior to normal campfire songs! Be that as it may, you'da thunk that a counselor who knows "Joe's Got a Head Like a Ping Pong Ball," "Mmm-Aaa Went the Little Green Frog," and "The Grand Old Duke of York" would have known this one too.